Some good discussion is happening over at The Conversation's website about the Night Parrot - the short answer, of course, is for its own protection! 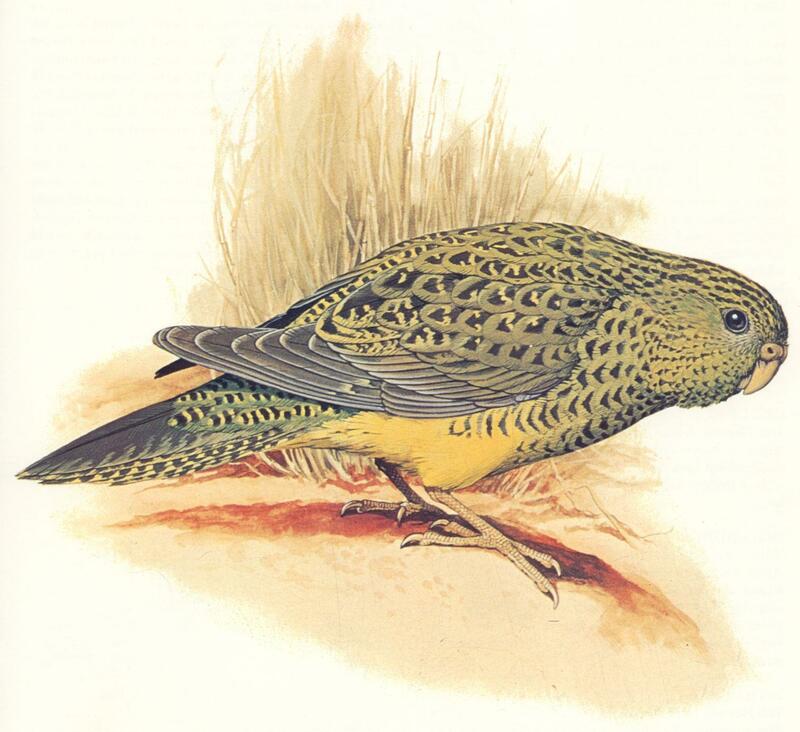 The Night Parrot has been called the “world’s most mysterious bird”. First discovered in 1845, it was rarely seen alive for most of the next hundred and seventy years, but it has been rediscovered in 2013 by Queensland naturalist John Young. 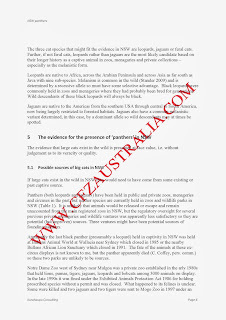 The rediscovery has been shrouded in secrecy; photo and video evidence of the parrot was presented at an invitation-only viewing, and the Queensland government hasn’t been told the location of the parrot. So, why all the secrecy? In 2013, Queensland naturalist John Young found what he thinks might be two pairs of Night Parrots, and, to top it off, a nest with three nestlings. Young recently presented a select group of experts with photographic and video evidence of Night Parrots from May 2013, confirming that these were indeed Night Parrots. Young also made recordings of the parrot’s vocalisations, which he used to draw the birds close enough to photograph. Young is keeping the Night Parrots’ western Queensland location secret for now. The fragile environments at the locality, if revealed, could be damaged by well-meaning but perhaps over-enthusiastic birdwatchers. The birds appear to have recently bred, and even relatively small numbers of people could have a serious impact. Disturbance could also interfere with research. 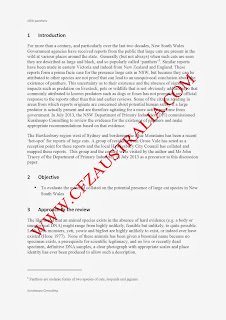 There is also the ongoing threat of illegal bird trade. Secrecy at least provides some restraint on this unscrupulous activity. 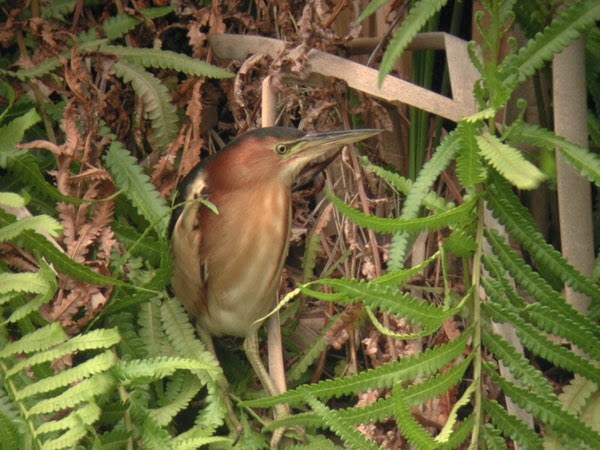 Dubbed Australia's 'bunyip bird', the Australasian Bittern is among the nation's most endangered species, and they've taken a liking to rice crops. A pilot study conducted last summer identified rice growers as custodians of what appears to be the largest population ever recorded. Neil Bull from the Ricegrowers’ Association of Australia (RGA) said it was very encouraging to confirm a minimum of 70 individuals using rice crops during the 2012-13 season. 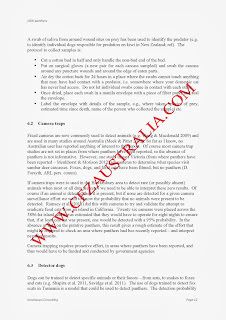 "Only a small proportion of rice crops were surveyed, so the actual number was likely to run well into the hundreds. It's now clear that the rice industry can play in a key role in the conservation of bitterns," Mr Bull said. Bitterns Boom in Rice from BitternsBoomInRice on Vimeo. Ecologist Matt Herring, who is continuing the bitterns in rice study this season, said there are some key questions to answer in order to help the birds. "Now that we know rice crops are so important for bitterns, we need to get a more accurate population estimate so that we can monitor them, especially for birds that are breeding," he said. "We want to get a better idea of what it is about rice crops that bitterns like most. "Many rice farmers I've spoken to are chuffed to be supporting an endangered species and are keen to adopt bittern-friendly rice-growing guidelines where possible," Mr Herring said. Andrew Silcocks from Birdlife Australia is encouraging rice farmers to report their sightings of bitterns. "This is a very poorly-known species and it's a national conservation priority. The more we learn about bitterns, the better chance we'll have of boosting their numbers." 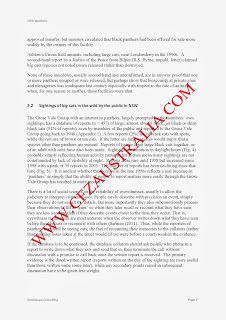 Sightings can be reported online via the Birdlife Australia website. No myth-taking what he saw - it was a big cat! 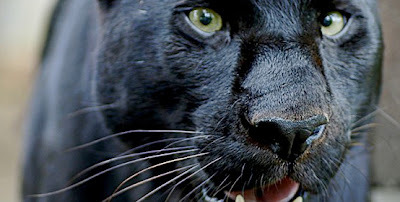 Weeks after the government declared the Blue Mountains big cat file closed, a Sydney father has spoken of a terrifying encounter with a panther-like creature outside his Riverstone, NSW home. Peter Russell told NSW Police he feared for his life after being stalked by a large, ''completely foreign'' feline predator at Riverstone, on the fringes of dense national park bushland. It has been sighted at least 12 times in the Riverstone area in recent years. On December 5, Mr Russell went to investigate why his neighbour's dogs were acting ''so distressed''. He said, as he looked along the path that led up the street, a very large, broad, cat-like creature ran straight for him. ''This was definitely no dog,'' he said. ''It had a low rumbling growl. It was between knee and hip height, extremely stocky and very fast. I spun on my heel and ran back towards the house. I didn't know that I was going to make it to the door. Mr Russell made it safely inside and called Riverstone police. 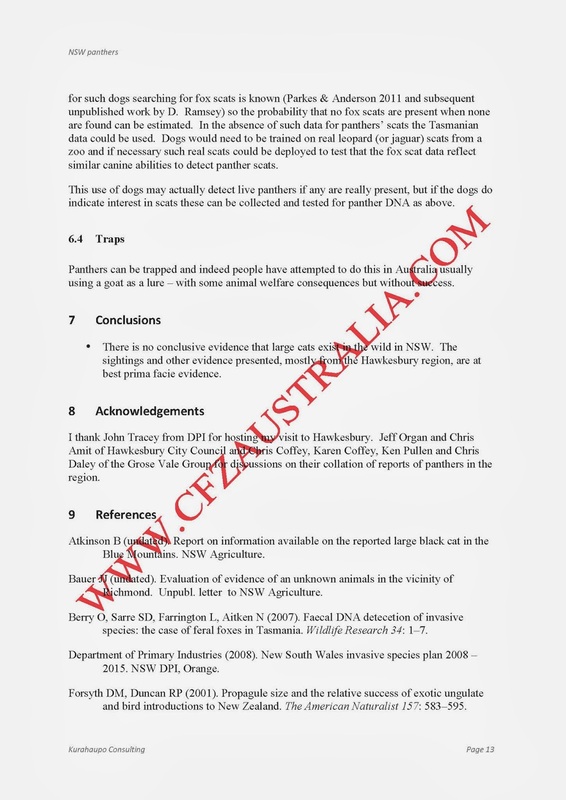 In November, the CFZ launched a project to find evidence for a surviving population of Thylacines in Tasmania, Australia. A team of 10 – five from the UK, five from Australia – went ‘in search of’ the Tasmanian Tiger, the first of several planned expeditions over a two-year period. While we’ve had a few bouquets and ‘good onyas’, we’ve also received a few brickbats and nasty asides, which is mildly amusing all things considered. We've even spent some time in the past few days directly responding to some of these ill-founded criticisms. 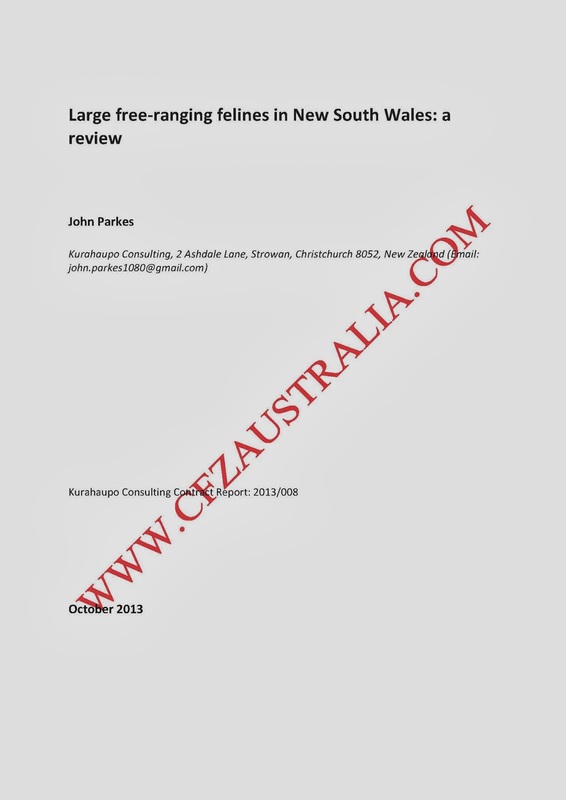 So here are the general criticisms and our responses to them, to save us time, as we won’t be visiting every cyber bolthole to personally respond to critics or address inaccuracies. Criticism: It was a success, when clearly it wasn’t. We never claimed it was! Put it down to journalistic licence – not everything you read is going to be verbatim, folks. 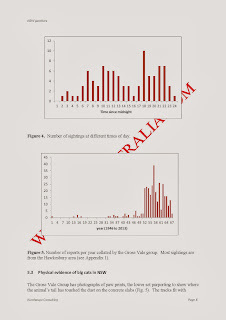 This trip is merely the first stage in a series of largely self-funded trips to be conducted over the next two years to gauge whether there is sufficient evidence of the Thylacine’s survival. Criticism: You created the perception that outsiders (outside Tasmania, that is) are coming to solve the mystery! No, we didn’t. 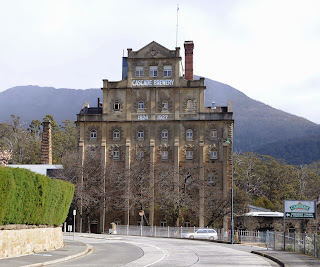 We have been liaising with some Tasmanians for many years. We have travelled down almost every year for the past eight years or so. This is a wildlife mystery that transcends state lines and international borders. We can’t control media interpretations or individual perceptions. Criticism: We have ignored the previous excellent work by other researchers. 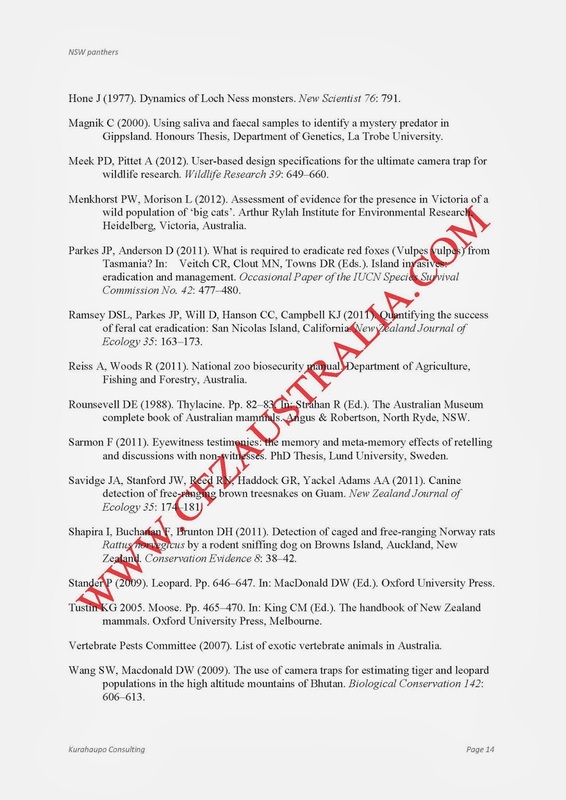 We have been at pains to continually mention the work of countless other researchers including some of the luminaries in the field – David Fleay, Stephen Sleightholme, Eric Guiler, Heinz Moeller, Col Bailey, Bob Paddle, and Nick Mooney, to name a few. Indeed, we are referring to their knowledge to inform what we are doing for our own project. The media edit, omit and relay information as they see fit – we have no control over the final news product. Criticism: The time period in the field is too short. We would have loved to stay longer but we are all governed by financial obligations and mundane work-a-day concerns. This was the first of many trips over a two-year period. Criticism: We had too many people, or we didn’t have enough people. The number of people on the trip is really irrelevant – members were split into teams to canvass areas, set up camera traps and interview witnesses. There was not, as some people might imagine, a conga line of cryptozoologists shuffling through the Australian bush. Criticism: We didn’t have the right background/expertise/knowledge to be undertaking the expedition. Bear in mind that many of the great zoological rediscoveries of ‘Lazarus’ species (those species labelled extinct that have been ‘rediscovered’) have been made by everyday people, including naturalists (surviving night parrot population), fishermen (coelacanth, subsequently handed to a museum curator), teenagers (the Bermuda petrel was found by a 15yo boy, and subsequently a naturalist and ornithologist), and bushwalkers (the NZ Takahe was discovered by a bushwalker who also happened to be a doctor of medicine). Many if not all scientists are at some stage informed in their discoveries by the knowledge of local people who are aware of the species but have felt no need to either classify them or study them in-depth. Seldom are these discoveries the work of just one person. 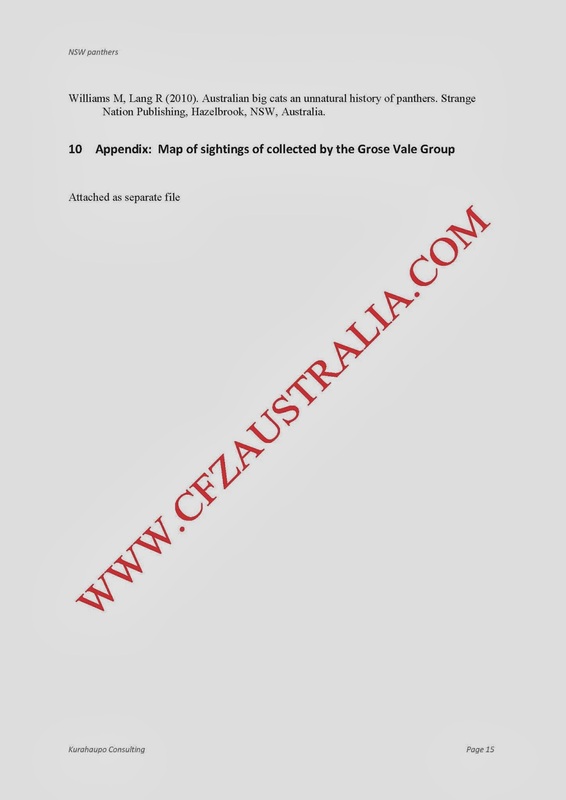 The team collectively is well read on the subject of Thylacines, have studied the scats and tracks of Australian (and in particular Tasmanian) wildlife, and plotted maps of contemporary sightings to inform the direction of the project. The team is also liaising with scientists and other naturalists over any interesting discoveries we come across. Like any good expedition, it’s all about teamwork both within and beyond the immediate team of people who travelled to Tasmania. If you think you can do better by all means get involved – the more the merrier, and we just might collectively achieve something great! If you think it’s all a waste of time, well, that’s fine too. But don’t waste your time or ours by moaning about it and expecting a reply. In the meantime, we’ll just get on with it. As I’m sure every one of you has had personal experience of by now, the Internet can be a fantastic time sink. And to our loyal readers, supporters, and peers – thanks for rallying behind our multi-faceted project. Let's hope some good comes of it. 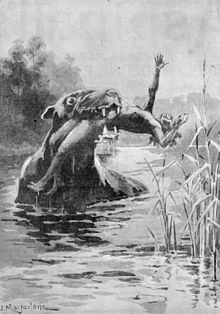 The legend of the bunyip has lived long in Australian history. Elders and long-time cattlemen have told of bubbling water, disappearing cattle and eerie sensations throughout the generations. Several communities claim the mythical creature lurks in their local rivers, but residents in one small Queensland township insist they have the waterhole where the bunyip resides. The Bunyip Hole at Mulgildie in the upper North Burnett is unsettling. It's a still pool blanketed with green slime, silent except for the occasional buzz of birds and flies. Known to bubble and gurgle, some Aboriginal elders believe the hole is connected to a network of underground waterways. Joan Farrell is the president of the local Bunyip Committee, and says the bunyip has a strong presence in the community. "I came here in 1975 and I kept hearing about the bunyip at the Bunyip Hole," she said. "Now, you don't go out there especially on dark and don't swim in it, because you can get dragged down never to be seen again." She said it was always her aim to see the Bunyip Hole become an attraction. "It was our 80th year in CWA and money became available, so we decided we would do it," she said. "Because I've been fascinated; I've had this thing with the bunyip all the time, that I would like to see it become like it is." On the side of the highway coming into Mulgilde stands a tall statue of the famed bunyip. He looks like a cross between a crocodile and a small dinosaur, and he's the creation of Brett Benecke. "We began with a bit of a design and nobody knew what a bunyip looked like so we made something up." 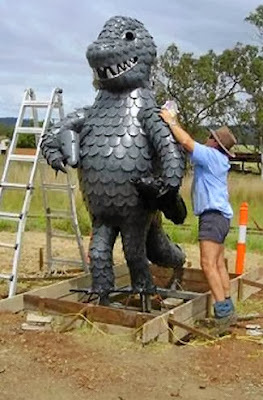 The bunyip statue, which holds a cow's skull in one arm and a lungfish in the other, is made of 6mm plate mild steel and took 18 months to construct. The tiny 49-house township held its annual bunyip festival on the weekend, which attracted about 250 visitors. The day was complete with a bunyip pie competition. 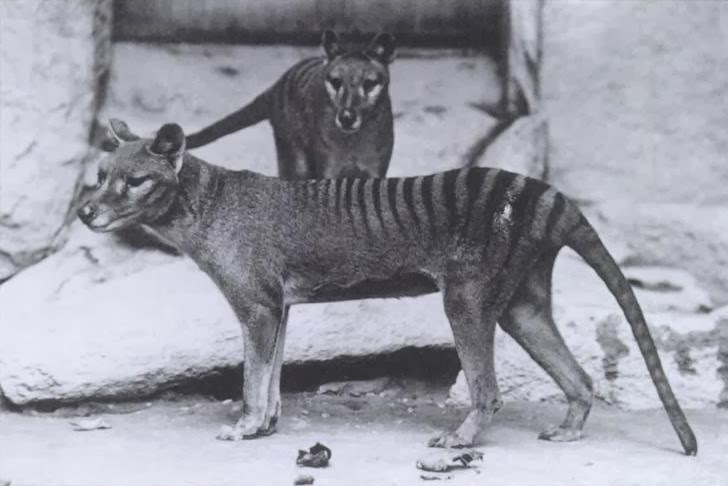 The last Tasmanian tiger died a lonely death in the Hobart Zoo in 1936, just 59 days after new state laws aimed at protecting it from extinction were passed in parliament. 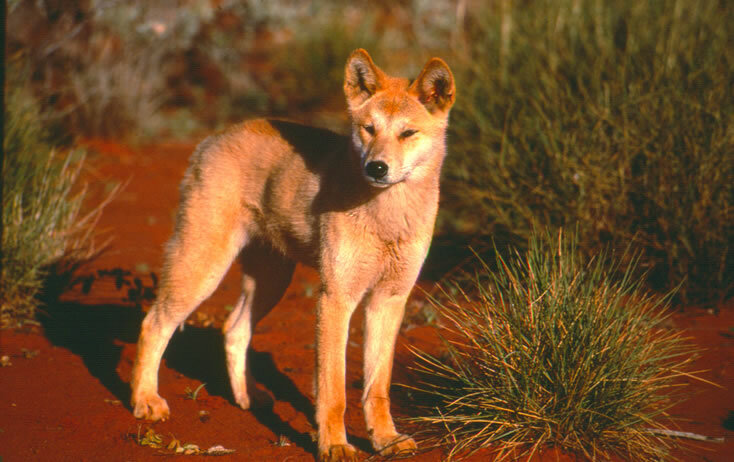 But the warning bells about its likely demise had been pealing for several decades before that protection came too late - and today we’re making many of the same deadly mistakes, only now it’s with dingoes. 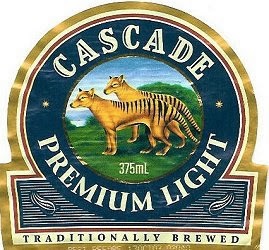 In what we think is one of the strangest marketing decisions ever made, Tasmanian brewery Cascade has dumped the iconic Tasmanian Tiger from its labels. As part of its rebranding to tap into the niche market for craft beer, it has ditched the (supposedly extinct) marsupial and replaced it with...a picture of the brewery. 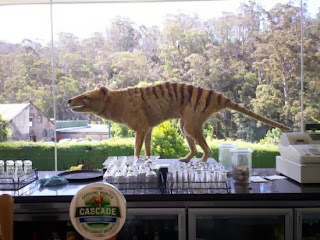 We've also heard Cascade has quietly moved its Thylacine model, the one which used to sit behind the bar, elsewhere in line with the new branding direction. We'll miss that Tiger! Thanks to Guillermo and the Google Apps team for helping us sort everything out. You guys rock! 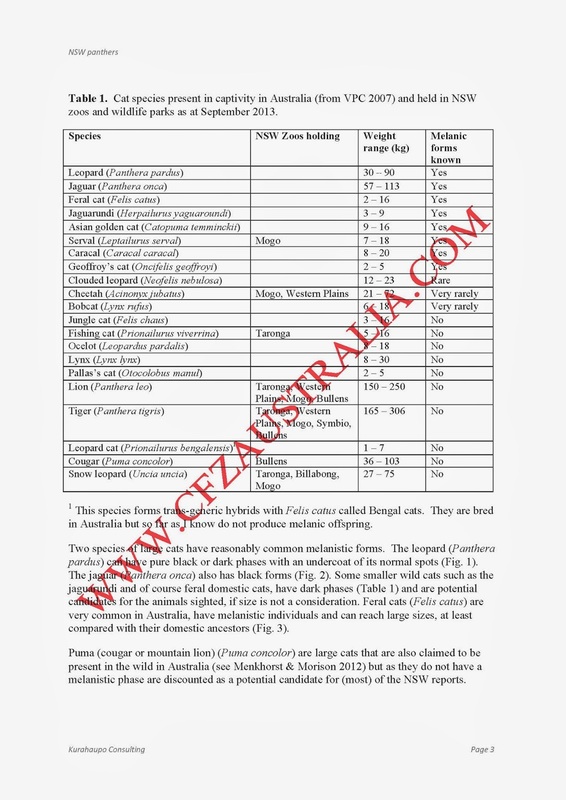 Is Thylacine truly extinct? The CFZ team not convinced. Humans may be responsible for the extinction of the West African black rhinoceros and the Caribbean monk seal, but what about the Tasmanian tiger? A team of zoologists is not so sure. 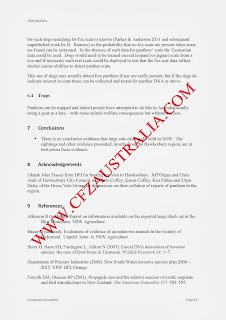 The Centre for Fortean Zoology (CFZ) recently launched a new hunt for the species, which was once endemic to Australia. The Thylacinus cynocephalus, commonly called thylacine or Tasmanian tiger for its characteristic stripes, was determined to be extinct as early as 1982. Researchers are now scouring near Smithton on the island of Tasmania, in an attempt to find evidence that the Tasmanian tiger endures. So far, the team has spoken to several locals who claim to have spotted the creature and have submitted samples of animal feces for DNA testing. The area is so damn remote, there are so many prey species and we have so many reliable witnesses who know the bush that I’d say there is a reasonable population of them left. ... The people who say they’ve seen it have nothing to gain and everything to lose. I’d say there is a population of at least 300 of them. According to the International Union for Conservation of Nature, the last reported Tasmanian tiger was captured in the wild in 1933 and taken to Tasmania's Hobart Zoo. Believed to be the last of its kind due to the population's decimation by Australian hunters, the animal died after three years in captivity. The question of whether the Tasmanian tiger is really extinct has plagued zoologists for decades. Every so often, researchers seek to disprove the species' extinct status by searching for new evidence of the thylacine's existence. Zoologists have been unsuccessful to date, and the Australian government still holds that no conclusive evidence has been uncovered. Until it is, the possible existence of the Tasmanian tiger remains a mystery. A species long believed to be extinct may be declared alive thanks to a team of British naturalists set on finding the elusive wild animal. A group from the Centre for Fortean Zoology has began looking for the Tasmanian tiger, also known as the thylacine, in Tasmania's northwest, where clues to the animal's existence have reportedly been found, The Guardian reports. "[We'll have] a lot of trail cameras, game cameras and we've all got infra-red devices ... just spotlighting, looking for tracks," team member Tony Healy told the Australian Broadcast Corporation. 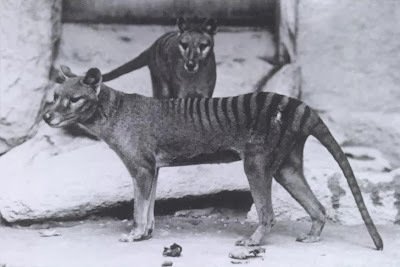 The last confirmed sighting of a Tasmanian tiger was in 1933, when one was captured and taken to the Hobart Zoo. It died three years later and the species was declared extinct in the 1980s. 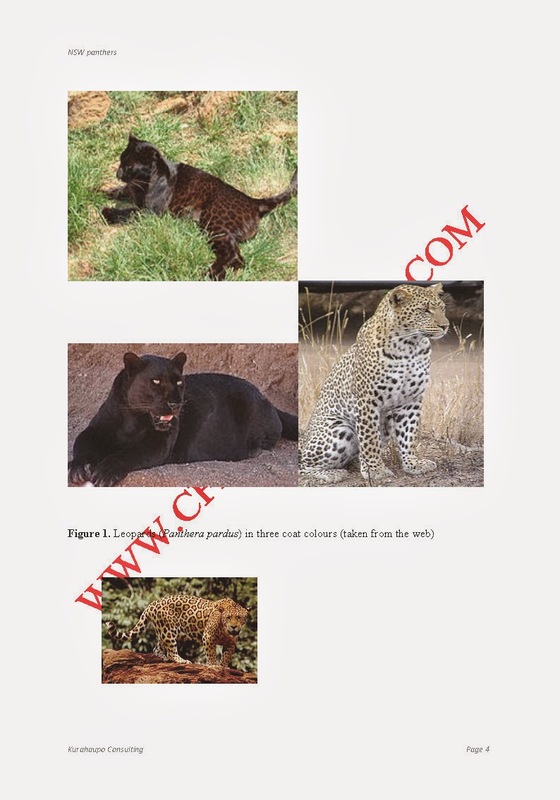 While there have been numerous sightings since then, none have been confirmed, according to the International Union for Conservation of Nature and Natural Resources. The animal, which looks like a large, long dog with stripes, was usually mute – except while hunting, when it made distinctive yaps. 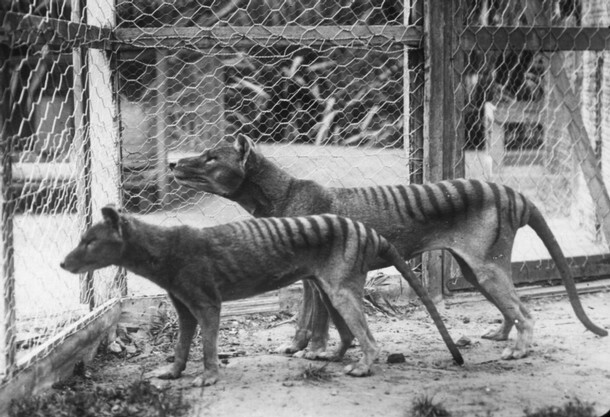 The arrival of European settlers are partially to blame for the Tasmanian tiger’s extinction where bounties were placed on thylacines’ heads, effectively wiping them out. Previous photographic searches conducted between 1988 and 1993 were inconclusive. Even the latest expedition has little support from the scientific community. "It would be great to have traditional scientists on board, but most scientists wouldn't put their name to this sort of thing anyway," expedition leader Mike Williams, a landscaper from New South Wales, told The Examiner. "Let's face it, it's not going to enhance your career with this sort of fringe subject." The team says they have spoken to several “highly credible” witnesses who have seen the Tasmanian tiger, including a forestry worker who reportedly saw the animal in daylight in 2011, and have collected animal feces that could belong to the thylacine which will be sent away for DNA analysis. 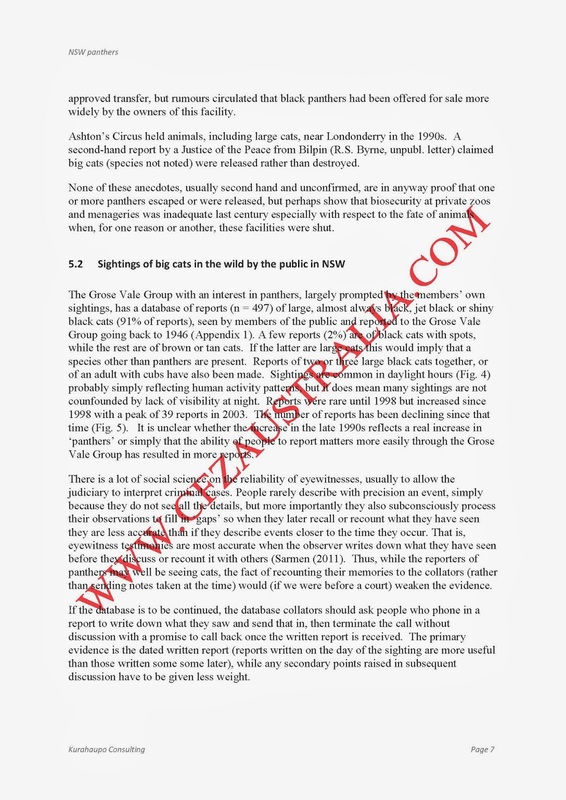 Credible witnesses and interesting scats - compelling evidence? It had been considered extinct for nearly 80 years, but the Tasmanian tiger has been declared alive and kicking by an intrepid group of British naturalists. A team of investigators from the Centre for Fortean Zoology, which operates from a small farmhouse in north Devon, is currently in Tasmania hunting down clues to prove the thylacine, commonly known as the Tassie tiger, still exists. The group claims to have gathered compelling evidence of the thylacine’s presence in remote parts of Tasmania’s north-west, despite the last known animal dying in Hobart Zoo on 7 September 1936. 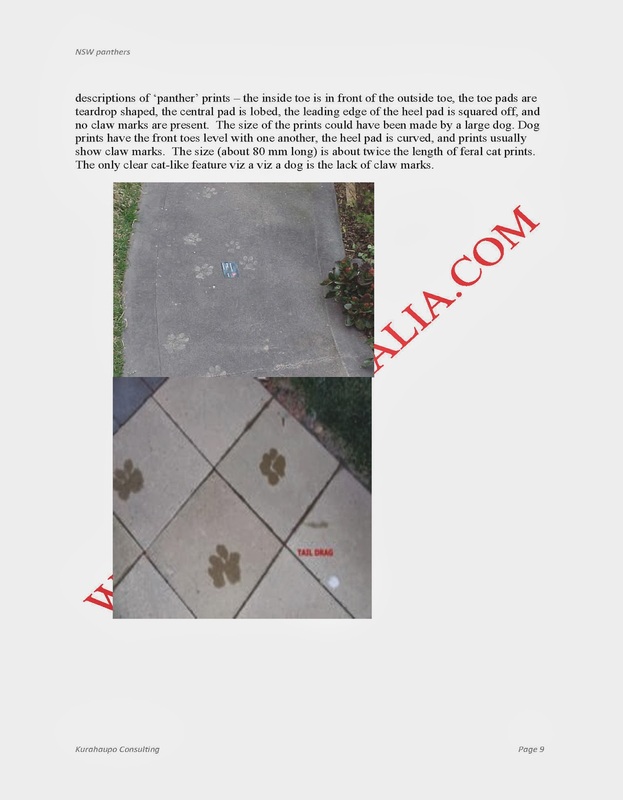 The Centre for Fortean Zoology said it has talked to several “highly credible” witnesses of the thylacine and has found animal faeces that could belong to the beast. The droppings have been preserved in alcohol and are being sent awayfor DNA analysis. The cryptozoologist team, which has previously attempted to find the yeti and boasts that has evidence of a mysterious Indonesian ape that walks on two legs, is one week into a fortnight-long trip to discover if the thylacine still exists. 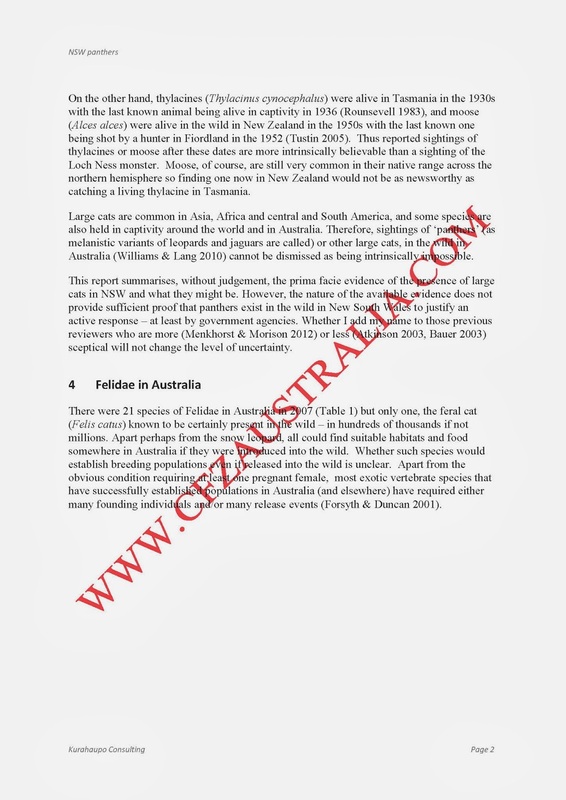 Richard Freeman, zoological director of the organisation, told Guardian Australia he has “no doubt” the species still roams isolated areas of Tasmania. “The area is so damn remote, there are so many prey species and we have so many reliable witnesses who know the bush that I’d say there is a reasonable population of them left,” he said. “I’d say there are more of them around in the world than Javan rhinos.” The World Wildlife Fund estimates that there are just 35 Javan rhinos left. Freeman said he had spoken to a forestry worker who had seen an animal in daylight in 2011 which was distinctive because of its striped rear end, long stiff tail and “weird rolling motion, almost like a cow” when it walked. 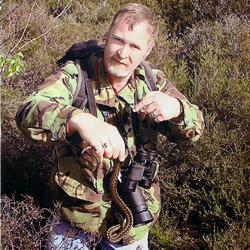 A government wildlife marksman and several local people had spotted the same distinctive type of animal in recent years, Freeman said. 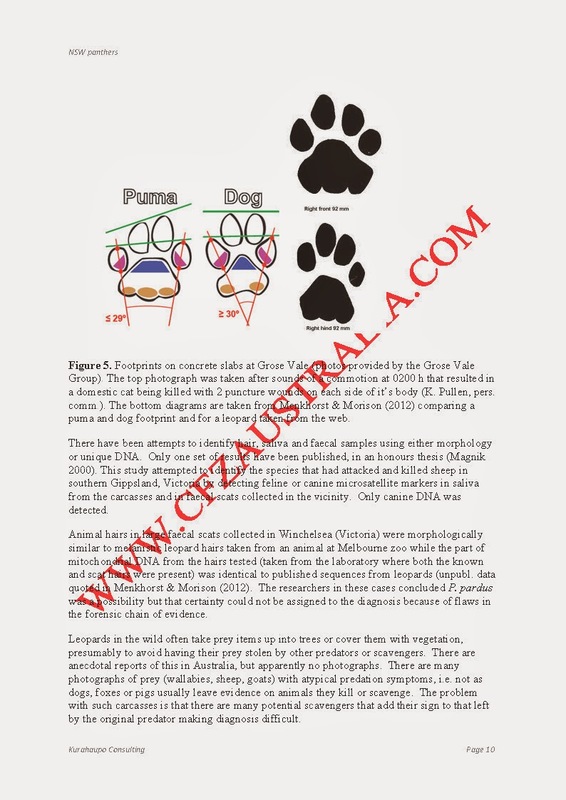 He admitted that no pawprints or dead thylacines have been found, attributing this to the sparse rocky ground of the region and the ferociousness of Tasmanian devils, which swiftly devour animal corpses when they discover them. 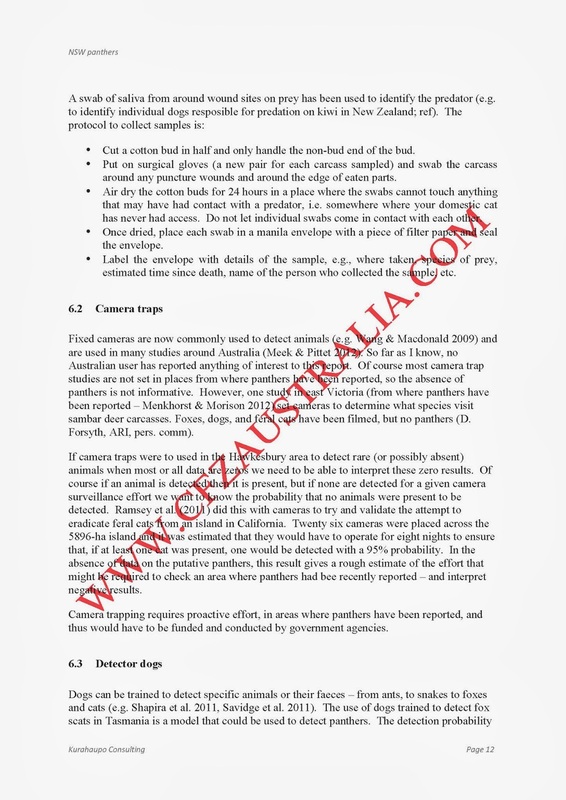 However, Freeman said he had heard reports of distinctive thylacine kills, where prey is effectively disembowelled, as well as the discovery of the droppings. “If we get the DNA from them, that’ll be interesting,” he said. “They are far too big for a Tasmanian devil and it can’t be a dog. Why would a dog be so far out there? It’s a very remote area. 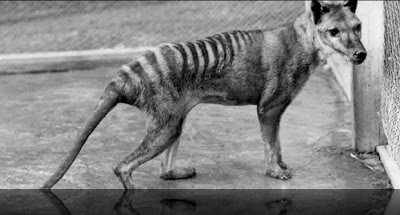 The thylacine, which looked much like a striped, elongated dog, was zealously hunted by European settlers. They were trapped, snared, shot and poisoned, due to fears the animal would ravage sheep stocks. Several attempts have been found to prove the animal still exists, although the Tasmanian government states that there is “no conclusive evidence” it lives on. That won’t deter Freeman, who plans several return trips to prove mainstream science wrong. “I’ll be coming back again and again,” he said. “The people who say they’ve seen it have nothing to gain and everything to lose. I’d say there is a population of at least 300 of them. There is to be another bid to search for evidence that Tasmanian tigers are alive and well. 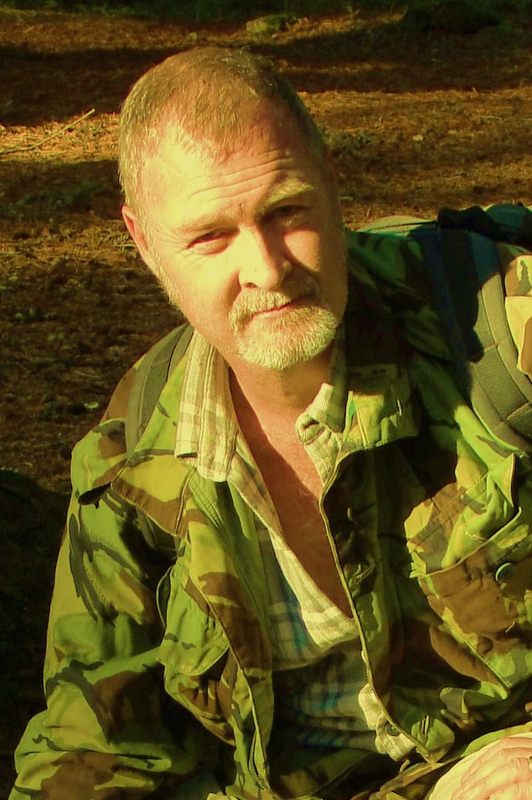 Representatives from the UK-based Centre for Fortean Zoology will join local searchers venturing into the wilderness of Tasmania's north-west. 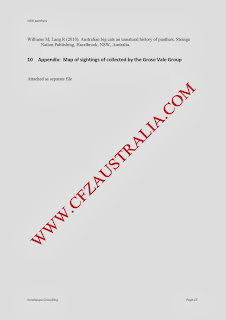 The British cryptozoologists have previously tried to find Australia's so-called "big foot", the Yowie. Expedition member Tony Healy says the team will use a range of equipment. "[We'll have] a lot of trail cameras, game cameras and we've all got infra-red devices... just spotlighting, looking for tracks," he said. The group will break into small parties to stake out different areas. 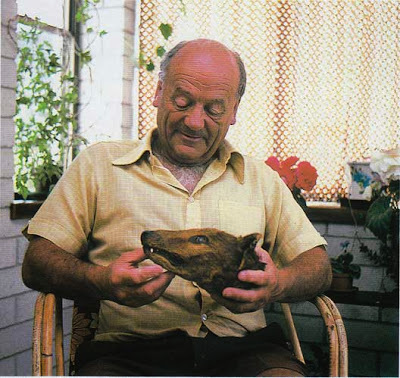 Long-time tiger enthusiast Col Bailey has spent decades trying to find evidence that Tasmanian tigers still exist. He has reservations about a group of 10 people searching together. "That's a lot of people to take into the field at the one time because low numbers is essential as far as I'm concerned in this and they also say two weeks they're going to be out," he said. "Well, two weeks is nearly not enough time, you really need three or four weeks to do this properly." The centre, founded in 1992, is a not-for-profit group set up to investigate unusual or extinct animals. 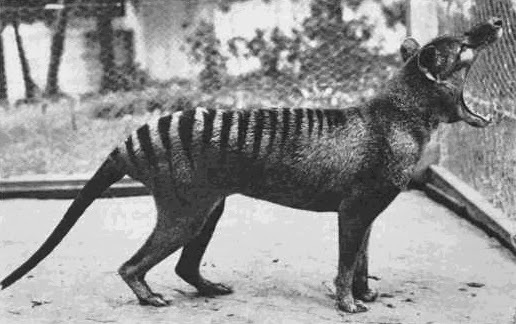 The last Tasmanian tiger, or thylacine, died in a Hobart zoo in 1933. The carnivorous marsupial was widely hunted by early settlers trying to protect livestock. The thylacine has officially been put on notice: the hunt is on. An international team of naturalists from the Centre for Fortean Zoology has arrived in Tasmania for the first in a series of well-resourced and professional expeditions into Tasmania's wilderness to hunt for evidence of the Tasmanian tiger. 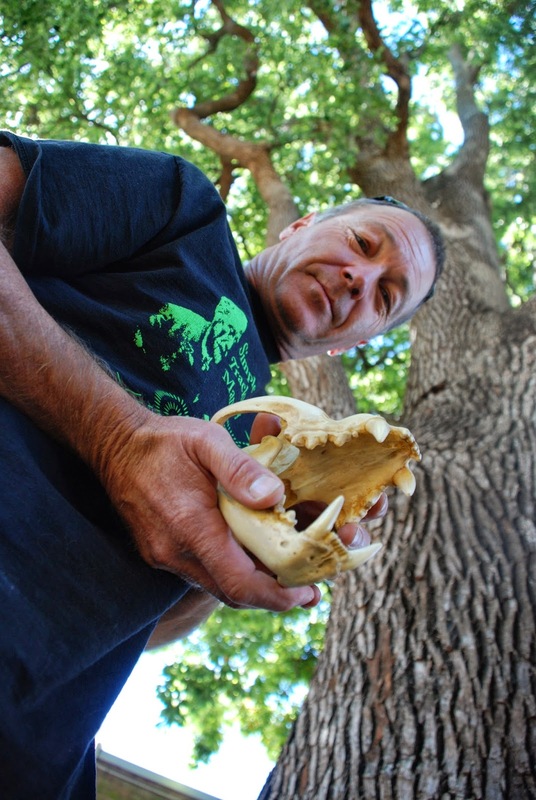 Although the animal was officially declared extinct in the 1980s, reports of thylacine sightings are still common and expedition leader Mike Williams from NSW has high hopes that they can find something. "The problem with a lot of the sightings from members of the public is that they're generally caught by surprise, and their photos are taken on things like mobile phones and aren't very good," he said. "It will take really good quality video to really convince anyone and preferably a video shot by a person, so we've brought as much gear as we can to improve our chances of being ready if we do see one." 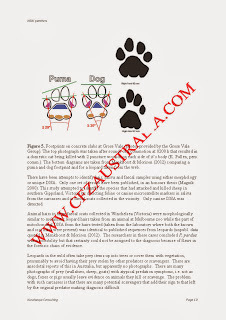 Mr Williams is highly regarded in his field and has spent many years searching for evidence of the big cats that are said to roam areas of rural NSW and Victoria. He is careful not to be too specific about the regions they will investigate in Tasmania, but said they would focus on the state's northwest and southwest. "We're meeting up with some eyewitnesses to begin with and that will help us narrow down our search areas," he said. This first expedition of 10 people will run for about two weeks and will be one of eight or nine expeditions over the next two years. The expedition, sponsored by Toyota, includes British expeditioners Dr Chris Clark and Richard Freeman – who have searched for giant anacondas in Africa and the Indonesian equivalent of Bigfoot on the island of Sumatra – and Hobart-based Dr Hannah Jenkins. 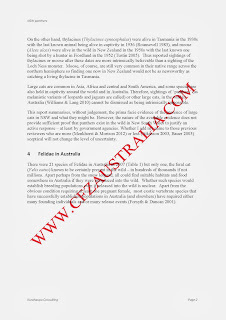 The Centre for Fortean Zoology is based in the UK and Australia and investigates "mystery animals" that are considered rare, extinct or undiscovered, such as the big cats rumoured to live in the Australian bush, and Australia's Bigfoot, the Yowie. 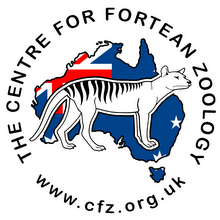 The thylacine has a special place in the international organisation's ethos: it is featured on their emblem. While in Tasmania the group will also busy itself searching for evidence of feral foxes and identifying healthy devil populations free of the facial tumour disease. "Let's hope between our resources, those of independent researchers, and the government's, something comes to light," Mr Williams said. 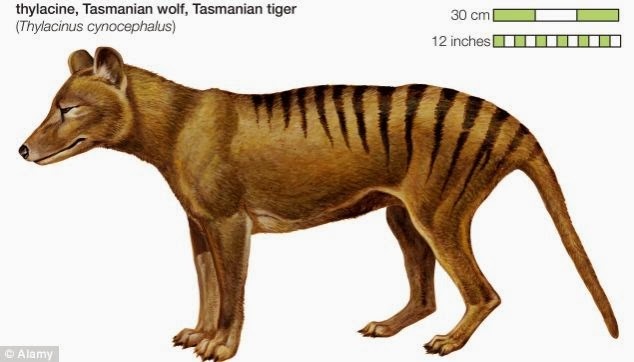 It has been ‘officially extinct’ for decades, but two British scientists have set off across the world to hunt for the curious animal known as the Tasmanian tiger. The last known tiger died in captivity in a Tasmanian zoo in 1936, but a team of enthusiasts believe there is still a chance that several of the animals might still be roaming the forested regions of the island state. British scientists Dr Chris Clark and Richard Freeman, who have searched for giant anacondas in Africa and the Indonesian equivalent of Bigfoot, are due to arrive in Tasmania today (November 1, 2013) to join an expedition searching for the tiger, which has a dog-like appearance and a striped body. ‘This is very serious and we’re putting aside all the other crazy things like Bigfoot hunts and concentrating very much on getting the first convincing evidence that the Tasmanian tiger still exists,’ expedition leader Mike Williams told the MailOnline from the search base in the island capital, Hobart. While there have been reported sightings of the tiger, known scientifically as a thylacine, Mr Williams said the evidence has never been strong enough to be convincing. ‘The problem with a lot of the sightings from members of the public is that they’re generally caught by surprise and their photos are taken on things like mobile phones and aren’t very good. Dr Clark and Mr Freeman, from Britain’s Centre for Fortean Zoology, have explored many of the world’ outstanding mysteries and remain dedicated to cryptozoology - the study of unknown animals. The centre is based in an old country house in Devon, parts of which are over 200 years old, and which is said to be home to several ghosts. The Tasmanian tiger features strongly as a ‘most wanted’ animal among the centre’s members - a picture of one is used as the group’s emblem. The British researchers, along with Mr Williams and his expedition members, will be searching densely forested areas in the island’s north and south west. ‘If we didn’t think there was even a slim chance of stumbling upon evidence in the form of droppings, hair or footage then we wouldn’t have committed to this expedition,’ said Mr Williams. The team will be using two powerful four-wheel-drive vehicles which will be loaded with cameras, dashboard video cameras and powerful binoculars. The thylacine is believed to have roamed the Australian mainland in ancient times before it became extinct there about 2,000 years ago - but it continued to thrive in Tasmania. But the arrival of Europeans sealed its fate. 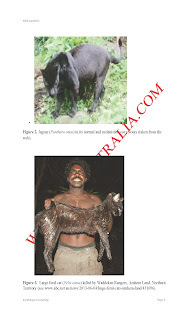 The animal was hunted for its fur and because it was responsible for attacks on settlers’ sheep, resulting in alarming photographs showing gunmen standing proudly beside the corpses of piles of animals they had shot down. With the death of the last known tiger - referred to as Benjamin - in the Hobart zoo in 1936, all that has remained of the elusive animal in recent times has been reported sightings in isolated parts of Tasmania. An international team of naturalists from the Centre for Fortean Zoology will go in search of the Tasmanian Tiger, Thylacinus cynocephalus, in one of the biggest concentrated searches yet for the elusive animal, which was officially declared extinct in the early 1980s. Expedition leader Mike Williams said the trip – generously sponsored by Toyota Australia, and the first of several to be mounted by the group - will explore densely forested areas in the State’s north and south west. “If we didn’t think there was even a slim chance of stumbling upon evidence in the form of scats, hair or footage, then we wouldn’t have committed to this expedition,” he said. 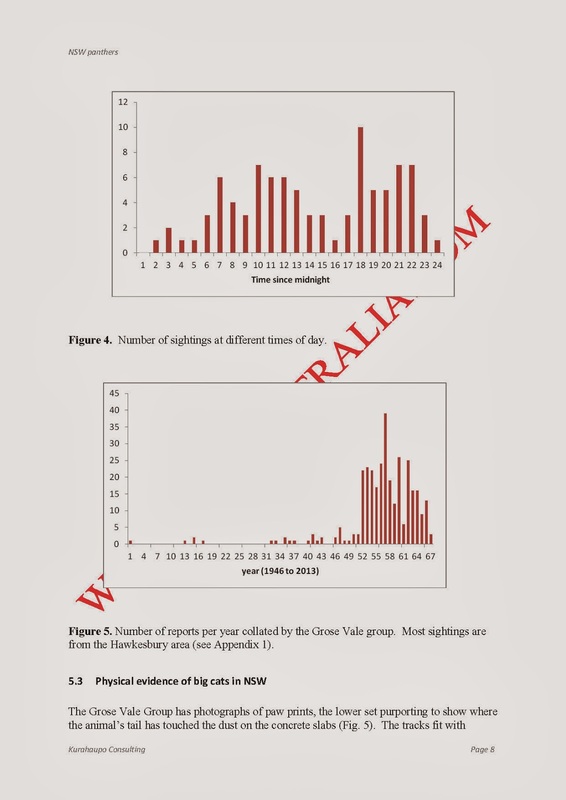 “Good quality Thylacine sightings are still being reported right across the state of Tasmania – 77 years after the last Thylacine died in captivity in a Tasmanian Zoo, and 27 years after it was declared extinct by the Tasmanian Government. “A secondary aim of the trip is to look for evidence of healthy Tasmanian Devil, Sarcophilus Harrisii, populations in remote wilderness areas. “We will also be monitoring for the presence of the No. 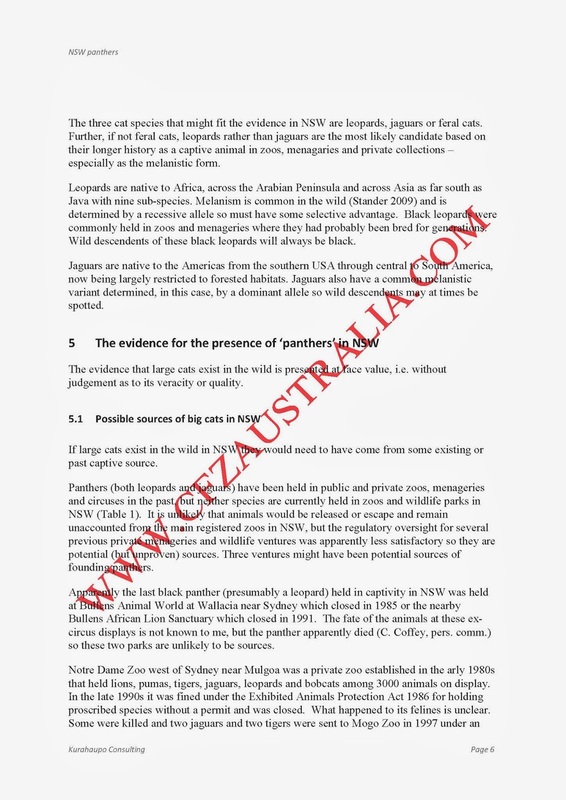 1 enemy of the State, Vulpes vulpes, the fox, rumoured to have established itself in Tasmania, and presently the subject of a multi-million dollar government-sponsored hunt. 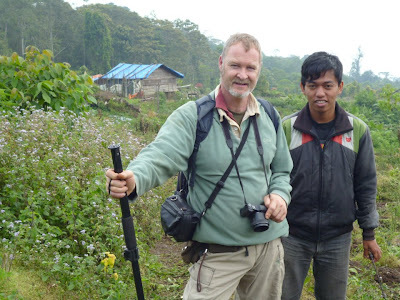 The team is highly experienced; several members have been on expeditions all over the world, including to Sumatra in 2011 in search of a mystery primate, the so-called Orang pendek, an as-yet unclassified species attracting serious scientific interest. The team will be traversing the difficult terrain in two Toyota LandCruiser 200s – the luxury Sahara V8 Turbo-Diesel and the GX V8 Turbo-Diesel – and using sophisticated game cameras, starlight scopes, and dash-cameras. Expedition team members include: Dr Chris Clark (UK), Richard Freeman (UK), Dr Hannah Jenkins (TAS/AUS), Tania Poole (VIC/AUS), Michael Williams (NSW/AUS), Rebecca Lang (NSW/AUS), Tony Healy (ACT/AUS), Orrin Hare (UK), Lisa Malam (UK), and Jonathan McGowan (UK). 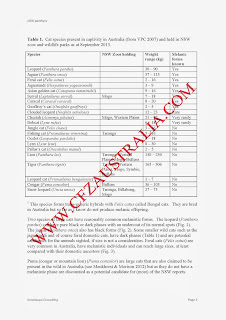 Mike Williams can be contacted on 0416 303 371. Toyota LandCruiser 200 GX Turbo-Diesel. We love a good movie poster and this one is a pearler! A new poster has been released for the upcoming Australian horror feature "Throwback." Designed by Brazilian artist Juarez Ricci, the retro-style poster evokes the '60s/'70s creature features and pulp adventure movies that inspired the film itself. Writer/Director Travis Bain says he wanted to avoid the clichés of contemporary movie posters. "From the get-go I knew I wanted an illustrated poster rather than your typical modern 'floating heads' Photoshop design," Bain says. "Juarez's work reminds me of the old Drew Struzan and Richard Amsel posters I grew up with, so he was a natural choice to create this artwork." 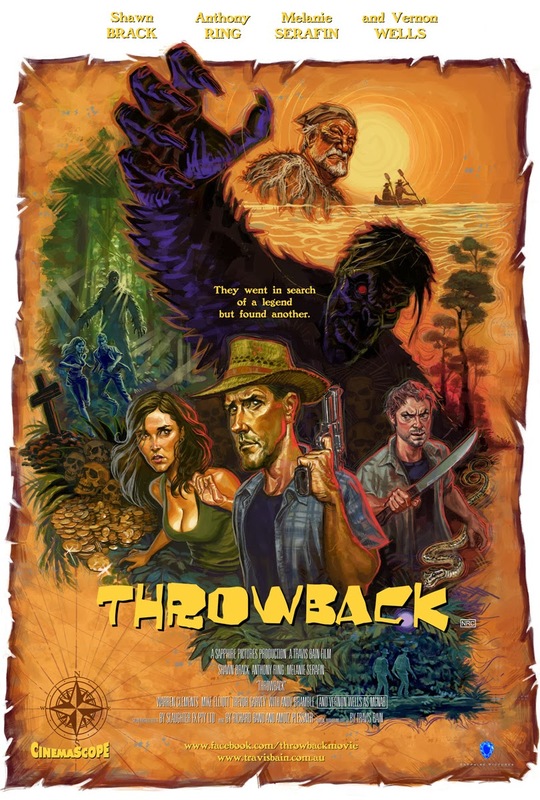 "Throwback" recently premiered at the Bram Stoker International Film Festival in England, and Australian and North American premieres are expected to be announced over the coming months. Already the film has received strong interest from the prestigious Tribeca Film Festival in New York, which recently invited Bain to submit "Throwback" for consideration for their 2014 programme. "It's not an official acceptance, but it's a step towards one," Bain says. "They're very keen to see the film, so we're crossing our fingers they'll select it for their Midnight Section." "Throwback" is expected to be released on DVD, Blu-ray and VOD in 2014. For film festival or distributor enquiries, visit www.travisbain.com.au or www.facebook.com/throwbackmovie. A doctor, dentist, solicitor, clergyman and Qantas pilot have all seen it, as have numerous Rural Fire Service volunteers and an officer from the Department of Agriculture. 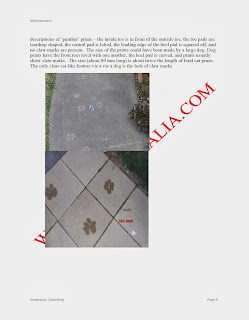 A NSW detective spoke of how he watched the beast, from barely 50 metres away, for more than a minute. 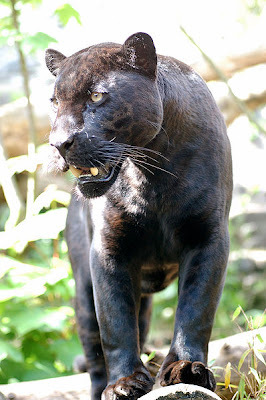 And like most others, he is "convinced" it was a black panther. 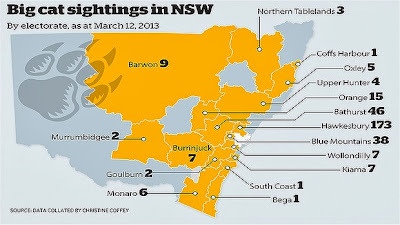 Rumours have circulated for decades about a colony of "Big cats" roaming Sydney's western fringes and beyond. 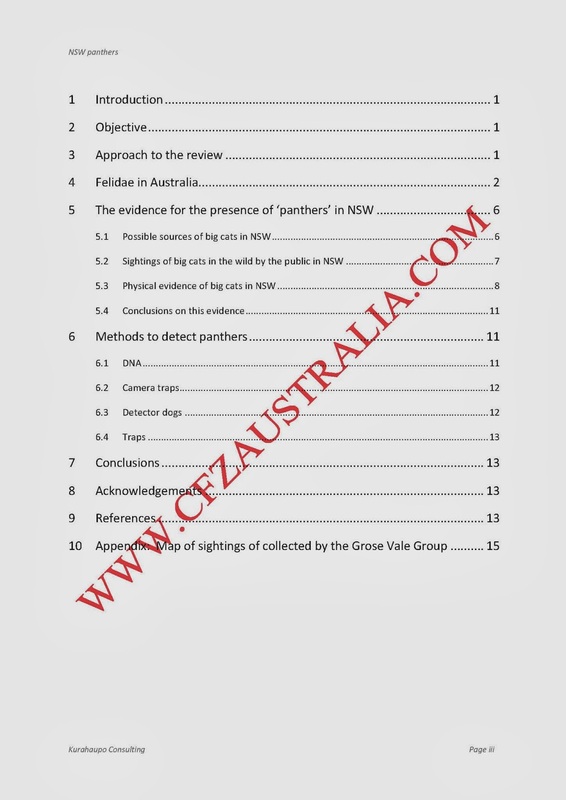 But today, a report commissioned by the State Government has concluded that the many hundreds who have seen the panther are wrong. Ms Coffey said of the report: "We continue to be treated like fringe-dwelling idiots. This is an insult to everyone who has seen the creature." 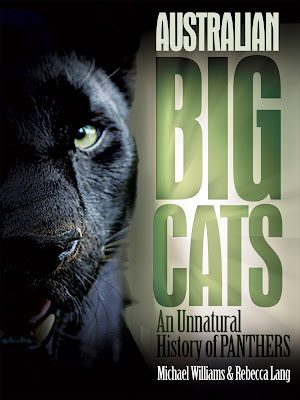 Interestingly, like many state government 'big cat' reports before it, the book Australian Big Cats: An Unnatural History of Panthers was used as a resource! On October 5, Australian Big Cats: An Unnatural History of Panthers authors Rebecca and Mike are hosting a Blue Mountains Panther Walk during the annual Festival of Walking in the Blue Mountains of NSW. It’s one of Australia’s greatest wildlife mysteries – do ‘big cats’ really roam the bush? 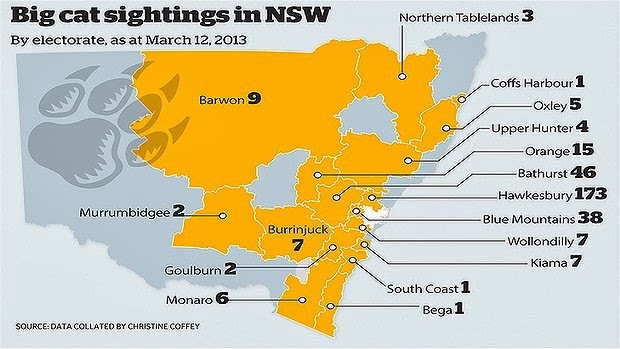 Sightings of black panthers have been made all over Australia, many of which have taken place in the Blue Mountains. 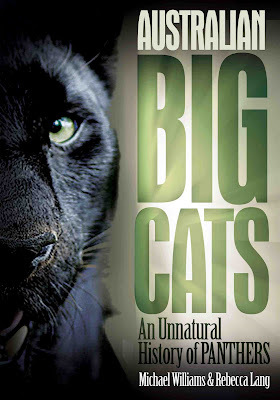 Join the authors of Australian Big Cats: An Unnatural History of Panthers and hear about some compelling local sightings, see casts taken of suspected ‘big cat’ prints, look at some of the best photos taken of monster moggies, and find out what might be behind these stories. Are you brave enough to join the hunt? Come join us for a walk and a talk. Seen a big cat? Tell us about it!